I’m a recovering pedant. I try not to let my work as a copyeditor/proofreader spill over into my daily life. I know how annoying it is to have someone gleefully pointing out errors, not least because there are so many of them all around us that once you get started, there’s scarcely room for anything else. And to a certain extent, as long as the communicative intent is clear enough, what are a few stray apostrophes or typos between friends? See below, and weep. I’m sure many of you received the same email. If you had images enabled in your mail reader, you are probably blissfully unaware of what was lurking beneath them. I envy you. 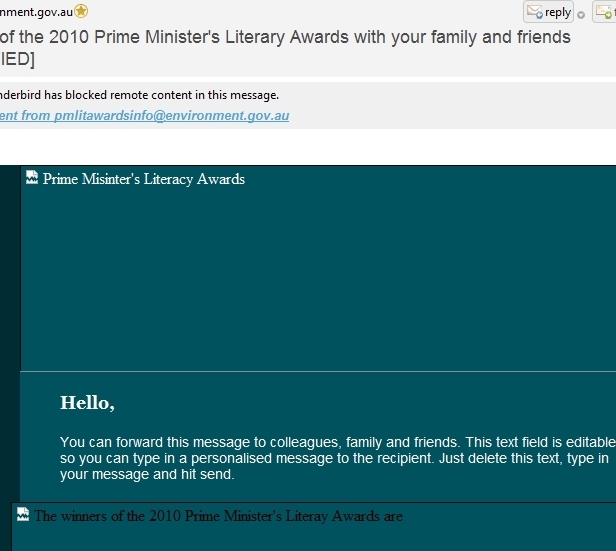 This entry was posted in Awards and tagged pedantry on November 12, 2010 by Meg McKinlay.